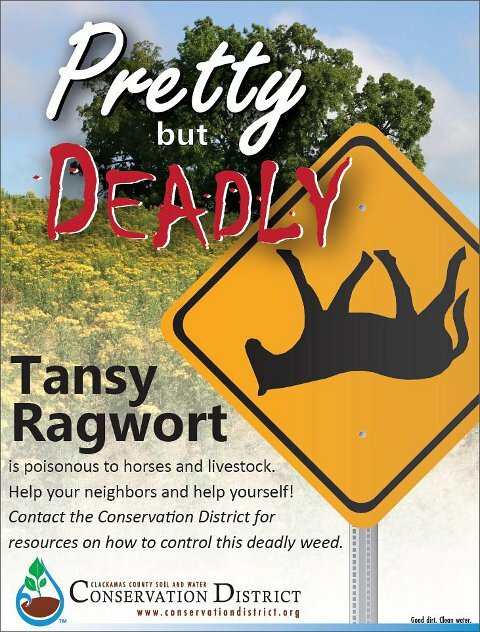 We’re keeping the same “Pretty Deadly” graphic this month as last month, because we’ve had daily interactions with people concerned about how much Tansy Ragwort they are seeing this year. Tansy Ragwort is toxic to horses and livestock, so controlling it is important. In the Projects section, we update you on work in our “3D area” water quality project and our Milk Creek instream and riparian habitat project. In the Water – Weeds – Wildlife section, we begin to discuss what to do about failing on-site septic systems. We’re working with a landowner on a rainwater harvesting system that will produce drinkable water. Weed reports continue to pour in, and pond weeds continue to be a recurring theme. California ground squirrels seem to be increasing this year. And there is plenty more in the other sections on Watersheds, Weather, Wildlands, Working Lands, Workshops, Working Together, and our Workplace. The first annual Small Farm School is set to debut in September. We look forward to seeing you there! Topics this month include: updates on the 3D and Milk Creek projects; what to do about failing on-site septic systems; harvesting rainwater and making it drinkable; weed reports are up; those pesky ground squirrels; and more!